The company behind a waste incineration plant near Ipswich is proposing that it could be used to heat a £30m greenhouse project. Sita UK, which is building a £185m energy-from-waste (EfW) plant at Great Blakenham, said it could create up to 180 jobs. 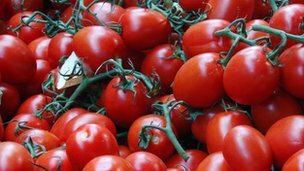 The firm and two local farmers want to build two large greenhouses producing 7,500 tonnes of tomatoes a year. They said it could be operational by December 2014. Sita is working with local farmers Michael Blakenham and Stephen Wright who operate under the name Sterling Suffolk. They own the land between Great Blakenham and Bramford where the greenhouses would be built. Cliff Matthews, Sita's regional manager, said: "It has always been our aim to develop a district energy network of pipes to utilise some of the heat from the EfW facility, which becomes available for other businesses and consumers. "This is the sort of scheme which could kick-start that." Sita, which is working with Suffolk County Council on the EfW project, said the incinerator would burn 269,000 tonnes of rubbish annually, generating enough electricity for 30,000 homes via the National Grid. Sterling Suffolk said the greenhouses would be about 560 yards (500m) long and 240 yards (220m) wide. Sita and Sterling said they were talking with a range of investors and expected to be able to submit a planning application to Mid Suffolk District Council next year.